Despite appearances, Fernandel is not actually going to eat the small, yapping dog. Movie details the travails of a married clarinetist suddenly left alone when his wife leaves to nurse a dying relative. Ironically, the relative will recover but boatloads of other principal characters and walk-ons get offed, as the mild-mannered musician is tempted towards infidelity with a chorine from the theatre, and this leads inevitably, with WOMAN IN THE WINDOW logic, to homicide. 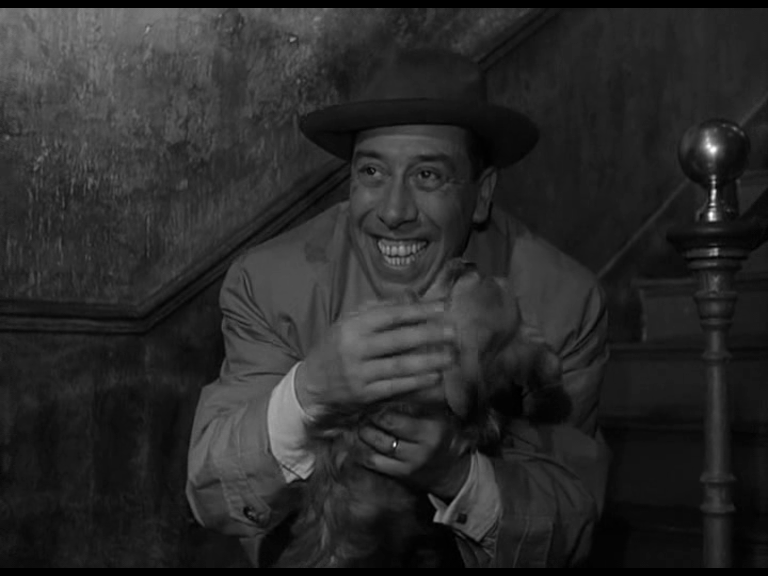 With “the face of a murderer,” Fernandel is immediately a suspect, and while avoiding being identified he tries to locate the real killer, assisted by a giggling blackmailer with a small yapping dog. I thought with L’AUBERGE ROUGE, your basic hilarious masterpiece, that I’d finally warmed to Fernandel, he of the equine visage, but now I find that, away from the rigorous direction of Autant-Lara, which F did not care for one bit, he seems limited again, not only mugging quite a bit, but mugging in the same way each time. We know from the earlier film that his amazing melting-taffy face can be made to assume all kinds of funhouse mirror contortions, like a Basil Woolverton cartoon made (saggy) flesh, so it’s odd to see it settling into a few stock positions and leaving it at that. Still, I have to admit his timing is excellent and the timorous would-be philanderer becomes quite sympathetic as his nightmare situation endlessly intensifies. The real star of the show is Bernard Blier as the repellant little man who’s threatening to expose Fernandel if he can’t find anyone better to extort from. 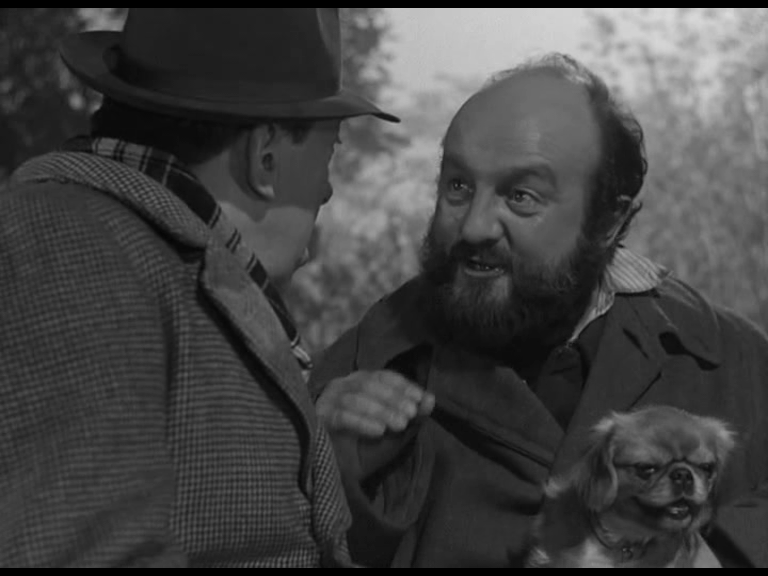 Blier was typically solemn as the third-act detective inspector in MANIVELLE, but here he throws off the dour habit of a lifetime to play a tittering creep with a full beard that gives his bald head an upside down appearance, and a seedy overcoat that flares out like a garden gnome’s smock. That inverted appearance is reflected in the scene where F discovers his first corpse, shot in the ceiling mirror of the tart’s boudoir, making the whole thing vertiginous and hallucinatory. What the movie lacks in belly-laughs (Duvivier shoots too close and cuts too fast, like many dramatically gifted filmmakers trying slapstick) it makes up for in a kind of comic anxiety which keeps escalating. This is what Polanski’s FRANTIC should have been like. 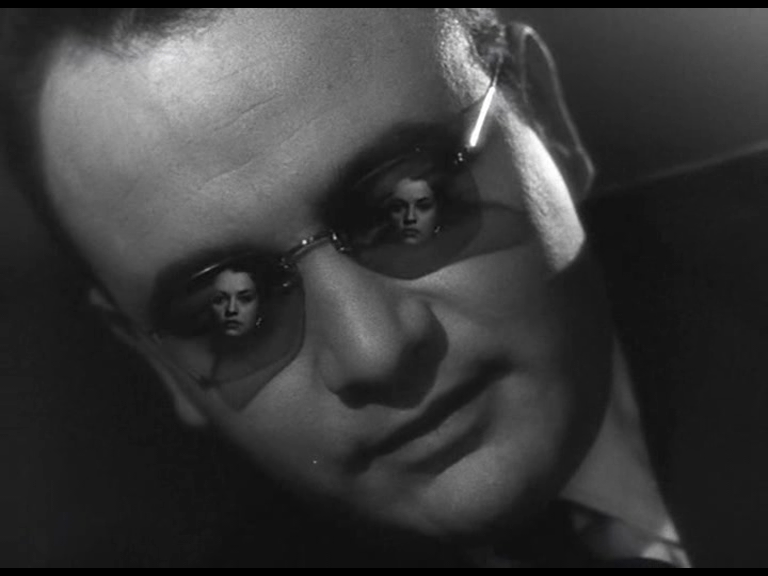 LES INTRIGANTES is from 1954, and directed by all-rounder Henri Decoin. Most interesting today for featuring Jeanne Moreau in a meaty supporting role, it’s an unusual thriller in which the one death is an accident which occurs before the action begins, and the biggest crime is a false accusation which makes theatre boss Raymond Rouleau a murder suspect. Moreau plays his wife, and the film’s best moments revolve around her — she starts out as a very positive character, loyal and supportive. As her husband is driven into hiding by the covert campaign against him, she starts running the show on his behalf, and her power and competence emerge in conjunction with an affair with her husband’s persecutor. The movie condemns her, and seems to equate her abilities in the workplace with her sinister infidelity — but it doesn’t altogether condemn her: there’s no comeuppance. As a director, Decoin seems to be mainly interested in legs — although he also gives us a subliminal flash of the Moreau bosom when baddie Raymond Pellegrin (very creepy) rips her dress off, which is apparently part of his infallible Gallic seduction technique (which also includes face-slapping and framing her husband — how can he go wrong?). But there are some very effective scenes, especially with all the lurking in theatre corridors. 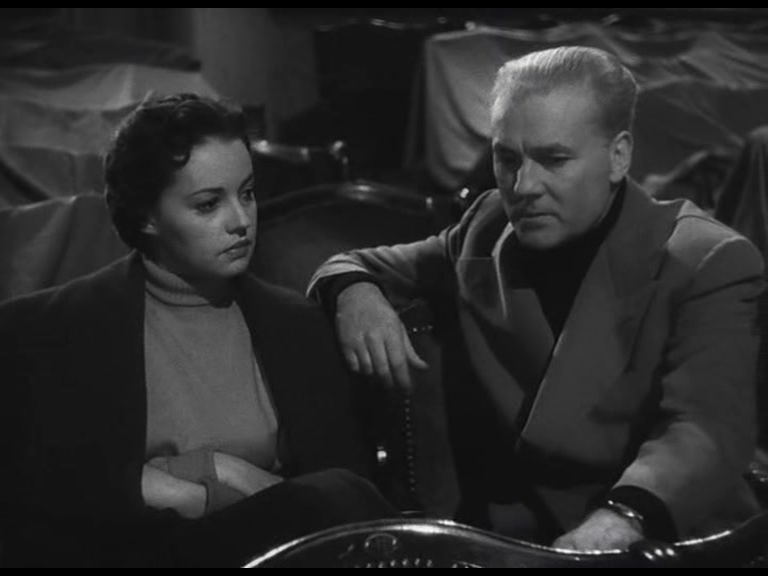 Raymond Rouleau has aged fairly well at this point, having lost the matinee idol/mannequin looks he sported in the forties. With his sports jacket and polo neck sweater, he looks a bit like the older Jacques Tati. Etchika Cherou is very cute and touching as the secretary who yearns for him, and Louis de Funes is well used in a supporting role that exploits his querulous, blinky schtick without overdosing us. Also, he seems less annoying with vestigial hair. Possibly because I didn’t initially recognise him and so didn’t get immediately put off. Both movies had a paranoid atmosphere, full of anonymous denunciation and persecution, which made me think they were recycling anxieties from the Occupation, though perhaps that’s stretching. Claude Autant-Lara’s L’AUBERGE ROUGE is unrelated to Jean Epstein’s earlier film of the same name. Now that we’ve got that sorted out, you can head over to The Forgotten and see what the fuss is about. Upon seeing the Autant-Lara, Fiona immediately added it to her favourite films list. We’re also dying to learn anything we can about the anonymous actor cast as the movie’s monkey. The film is a variant on the Sawney Bean legend, and apparently based on a true case of serial-killing innkeepers in France. 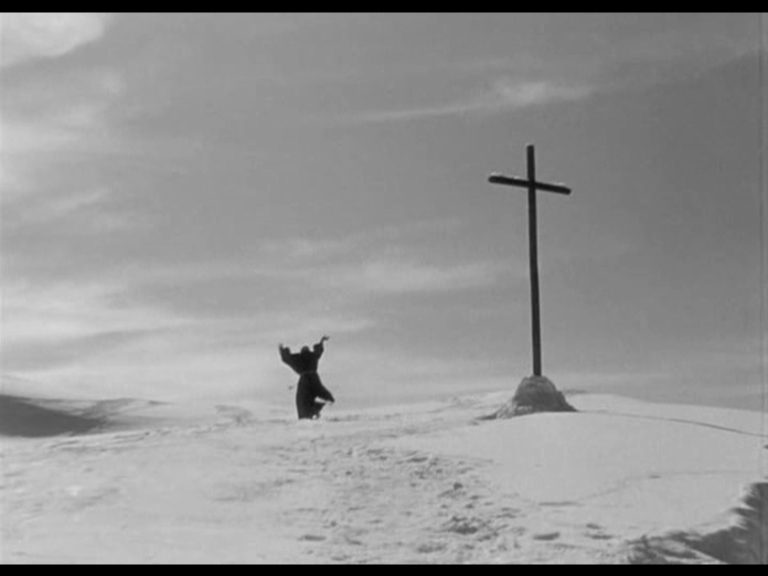 The comedy is black, the snowscapes are white, and Fernandel is looking a little off-colour.